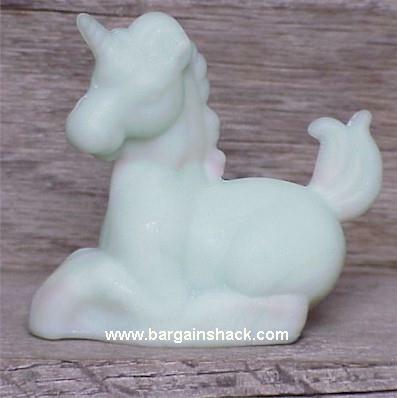 Lucky the Unicorn in Spring Beauty Satin, Bargain Shack offers Boyd Glass, Mosser Glass, L.G. Wright, and Contemporary Collectible Glass including Vaseline Glass - J.B. Scottie Dogs, Pooche, Animal Covered Nests, Toothpick Holders, Salts, Glass Animal Figurines, Clowns, Dolls, Slippers, Vehicles, and More! This is Boyd's Lucky the Unicorn in Spring Beauty Satin! This is the 81st color of the series with a production date of April 5, 2001. Lucky stands just over 3" tall and is 3-1/2" long and is in excellent condition. He has the famous Boyd diamond B trademark with 4 lines at the bottom edge of his base.